Everybody at the track was talking about the cure-all JESUS SHOT. Micron pen and colored pencils. We are only a mile or two west of El Paso. On many days, by noon, the fiendish winds are howling and moaning relentlessly and the grinding sands have darkened the horizon to the point we can no longer see the raw Franklin Mountains only a few miles away. Here in the heart of this almost Third World place, a few hundred yards from the banks of the Rio Grande River, sits the old Sunland Park Racetrack and Casino, and it is here, trackside, that we have been camped for the past few weeks. In late March, dreams of glory will ascend on this urban track as the Grade 3 Sunland Derby will be held and any horse placing in that race will be in contention to enter the Kentucky Derby. Mine That Bird won here and won the Kentucky Derby in 2009. It’s 4:45 in the morning - I’ve slugged down a glass of hopefully healthy warm lemon juice with honey and ginger, and again, I am walking the mile in darkness from the camper to the barns. Here I meet up with jockey Luis Robletto and follow him to the D&B Racing Barn. We pass horses already hooked up to the walkers with the lights of El Paso in the distance dimming as the sun rises. 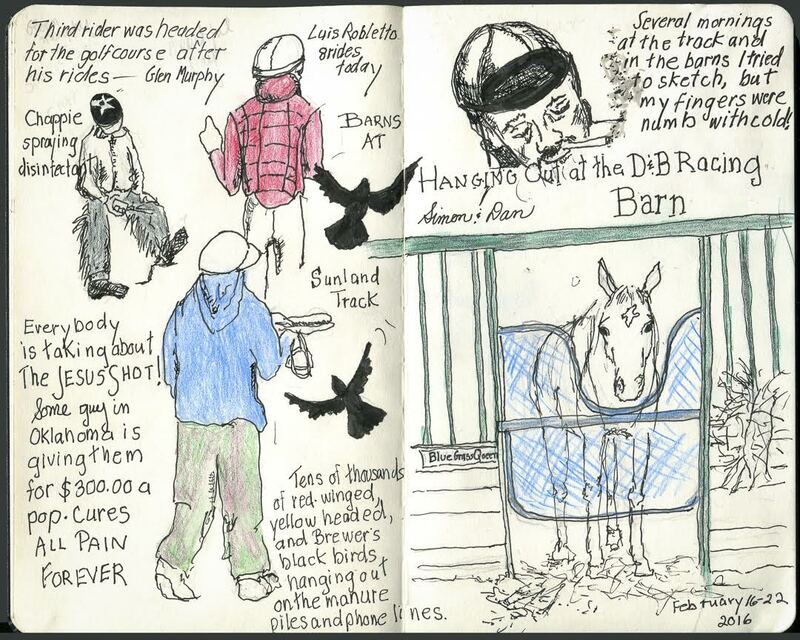 At the barn, the owners and trainers are busy planning the day’s schedule while a crew of stablehands is mucking out the stalls, cleaning buckets, and preparing feed bins. The grooms are picking, currying and brushing the thoroughbreds. They only tack them up when the gallop boy or girl is ready to ride. Each rider is paid $10.00 a ride. Heading deep into the dark barn, I walk behind as the arriving riders slowly make their way into the aisles stopping every few feet to hug or chat with a favorite mount. Styrofoam cups of coffee and cigarettes seem to be the breakfast of choice for most of the riders. The horses seem unaffected by the second-hand smoke. At seven, a voice booms over the loudspeaker announcing the track is open. The riders are quickly boosted into their saddles and head out into the rising sun. The sky lightens and the clouds of steam rising from the cooling towers of a power plant close to the track give the morning a warm and golden glow. In fact, it’s colder than hell out here. My fingers are freezing, and my breath is fogging the camera’s viewfinder. Voices call out, "Beautiful morning" "Take my Picture" "Jumpy" "Be careful, Señora." Horses all around me are clattering towards the track - I am briefly struck by how old some of the riders are. Particularly rambunctious are the young horses being brought up by an older horse to lead them through the racing routine. I cling to the side of a shack so as to not be in the way or get trotted over. …watching the faces of these people who are living a life they love. That is certainly a "different" experience from what us East coasters have. Not sure I would like the weather you are living with though. Where are you headed next ???? Really enjoyed this Peg. It brought back many memories as I used to hang out at Ruidoso Downs in my wilder days.